Environmental Science For A Changing World is a college-level introduction to environmental science, written for non-science majors and produced in partnership with Macmillan and Scientific American. The book’s aim is for each chapter to read like a feature article, where the scientific concepts are woven into a compelling narrative. I’ve posted the ledes to a few of my favorites chapters below. When Jim Howell, an ecologist and fifth-generation cattle rancher, first announced his plans to revive Horse Creek Ranch in Butte County, South Dakota, friends said he was either crazy or foolish. Sure, the ranch had once encompassed some of the best grazing land in the country, but persistent drought and too many cattle had long since brought those days of plenty to a close. Like so many ranches around it, Horse Creek’s pastures were too parched and degraded to sustain much of anything, let alone an entire herd of cattle. Across the Great Plains, rangeland (land that humans use to graze livestock) is drying out and ranchers are growing desperate. In some places, the degradation is so bad that prairie grasslands are becoming deserts. Normally this process, known as desertification, is both natural and slow. As climates shift over geologic time, grasslands morph into desert and deserts back into grassland in a cycle both never-ending and imperceptibly gradual. These days, it’s occurring much more rapidly than that—10 feet per year in West Texas alone. Part of the problem is climate change. But most experts agree that the biggest culprit, by far, is overgrazing—when too many animals feed on a given patch of land. Desertification is not unique to the Great Plains. 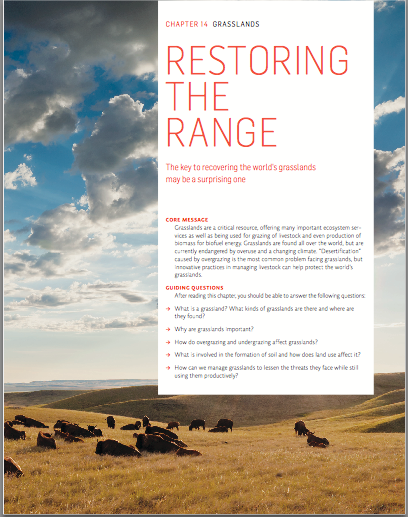 Around the world, from Afghanistan to Zimbabwe, 70% of the planet’s rangeland is threatened. This represents roughly one-third of the world’s entire land surface. And while the phenomenon has not garnered as much media attention as, say, global climate change, the consequences are no less dire. In fact, from the Fertile Crescent of ancient Babylon to modern-day developing countries like Darfur, desertification has been the stuff of wars. The cascade is both simple and devastatingly comprehensive: plants die, soil erodes, prairies fall to dust, famine sets in, economies falter, societies fail. Starting with Horse Creek—a forgotten ranch, in a fading prairie town—Howell and his business partners, who took control of the ranch in 2008, are working on a different solution, one that aims to repair economy and environ- ment in tandem. The bottom line, they say, is this: if you want to save the prairies, you’ve got to graze more cattle, not less. A thousand feet above the foothills of central Appalachia, near the Kentucky–West Virginia border, a four-seater plane ducks and sways like a tiny boat on an anxious sea. It’s windier than expected, and Chuck Nelson, a retired coal miner seated next to the pilot, grips the door to steady his nerves. The passengers have come to survey the devastation wrought by mountaintop removal—a type of mining that involves blasting off several hundred feet of mountaintop, dumping the rubble into adjacent valleys, and harvesting the thin ribbons of coal beneath. At first, the landscape looks mostly unbroken; mountains made soft and round by eons of erosion roll and dip and rise in every direction, carrying a dense hardwood forest with them to the horizon. But before long, a series of mountaintop removal sites come into view. Trucks and heavy equipment crawl like insects across what looks like an apocalyptic moonscape: decapitated peaks and acres of barren sandstone and shale. Smoke curls up from a brush fire as the side of an existing mountain is cleared for demolition. Orange and turquoise sediment ponds—designed to filter out heavy metal contaminants before they permeate the water downstream—dot the perimeter. Here and there, tiny patches of forest cling to some improbably preserved ridge line. “That’s where I live,” Nelson says, forgetting his air sickness long enough to point out one such patch. “My God, you would never know it was this bad from the ground.” The aerial tour has reached Hobet 21, which, at more than 52 square kilometers (20 square miles), is the region’s largest mining operation. So far, sites like this one have claimed roughly 400,000 hectares (1 million acres) of forested mountain, across just four states: Kentucky, West Virginia, Virginia, and Tennessee. But there is still more coal to mine. It could mean the obliteration of hundreds of thousands of more acres in the coming years. To stem this tide of destruction, environmental activists have sued the coal industry, the state of West Virginia, and the federal government. 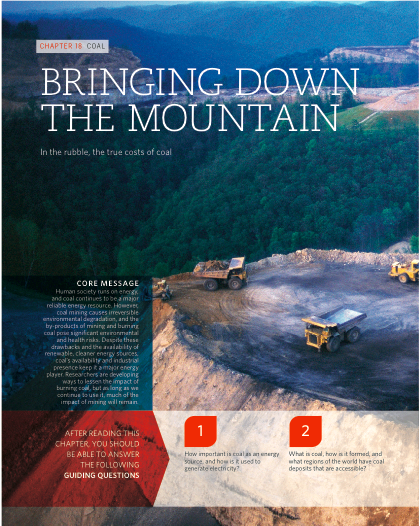 They argue that mountaintop removal mining destroys biodiversity, pollutes the water beyond recompense, and threatens the health and safety of area residents. And by obliterating the mountains, they say, it also obliterates the culture of Appalachia. Coal industry reps have countered by decrying the loss of jobs, tax revenue, and business the already impoverished region would suer if the mines were to close under the weight of too much regulation. They also point out that the culture of Appalachia is as bound to coal mining as it is to the mountains. Both sides count area residents, including miners, among their ranks. At the heart of the issue is coal itself—our country’s dirtiest, and most abundant, energy source—the one most responsible for rising CO2 levels from electricity production and also the one we rely on most heavily and the one we are consuming most rapidly. As the Appalachian reserves dwindle, debates raging throughout these decimated foothills are reverberating across our energy-addicted nation. From the deck of the SSV Corwith Cramer, the surface waters of the North Atlantic looked like smooth, dark glass. The 134-foot oceanographic research vessel had set out from Bermuda just 24 hours before on a month- long expedition aimed at tracking human garbage across the deep sea. It was a cool mid-June evening, the Sun was setting, and the crew had just launched its first “neuston tow” of the trip. Giora Proskurowski, the expedition’s chief scientist, stood watching as the tangle of mesh skidded along the water’s surface, or neuston layer, keeping pace with the ship as it went. It was hard to imagine that any garbage would be found in such a flat, serene seascape. After 30 minutes, crew members pulled the net—dripping with seagrass and stained red with jellyfish—from the water. Sure enough, when Proskurowski got closer, he could make out scores of tiny bits of plastic glistening in the mesh. The crew members counted 110 pieces, each one smaller than a pencil eraser and no heavier than a paper clip. Based on the size of the net and the area they had dragged it over, 110 pieces came out to nearly 100,000 bits of plastic per square kilometer (about 260,000 bits per square mile). Despite the water’s pristine look, the yield was hardly surprising. In the past 20 years, undergraduate students on expeditions like this one had handpicked, counted, and measured more than 64,000 pieces of plastic from some 6,000 net tows. That might not sound like much, given the vastness of the Atlantic and the smallness of the plastic. But the tiny bits were gathering in very specific areas, known as gyres. Gyres are regions of the world’s oceans where strong currents circle around areas with very weak, or even no, currents. 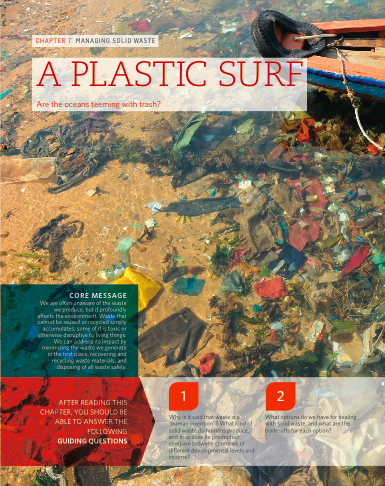 Lightweight material, like plastic, that is delivered to a gyre by ocean currents becomes trapped and cannot escape the stronger circling currents. When scientists first evaluated all the data from the Atlantic Gyre, they discovered surprisingly dense patches of plastic—more than 100,000 pieces per square kilometer—across a surprisingly large “high-concentration zone.” The press and general public would come to know this region as the “Great Atlantic Garbage Patch,” cousin to a “Great Pacific Garbage Patch” discovered around the same time, and, they suspected, to several other patches scattered about the ocean. Scientists knew where the plastic was coming from (seagoing vessels, open landfills, and litter-polluted gutters around the world). And they understood why it was being trapped in the gyres (wind patterns and ocean currents). But other questions remained. No one could say how big the Atlantic Patch actually was, or how all that plastic was aecting ocean ecosystems. Were the toxic substances found in plastic accumulating up the food chain, making their way into fish, bird, or even mammal diets? Were all those tiny bits of solid surface providing transport for invasive species? And why wasn’t there more of it? Despite a fivefold increase in global plastic production and a fourfold increase in the amount of plastic discarded by the United States, the concentration of plastic in North Atlantic surface waters had remained fairly steady across the 22 years for which data existed. To answer these questions, Proskurowski, his team, and their captain would sail the Corwith Cramer all the way out to the Mid-Atlantic Ridge, an underwater mountain range that lies about 1,600 km (1,000 miles) farther east than any previous plastics expedition had ever gone. “That’s far enough from Bermuda that getting back will be a challenge,” he wrote on the ship’s blog as land faded from view. “The same forces that drew plastic into this particular part of the ocean—namely low and variable winds and currents—will make operating a tall ship sailing vessel tricky, to say the least.” But if all went according to plan, Proskurowski thought, he and his colleagues would be the first to reach the so-called garbage patch’s easternmost edge. It was four o’clock in the morning and Marc Slattery could not sleep. 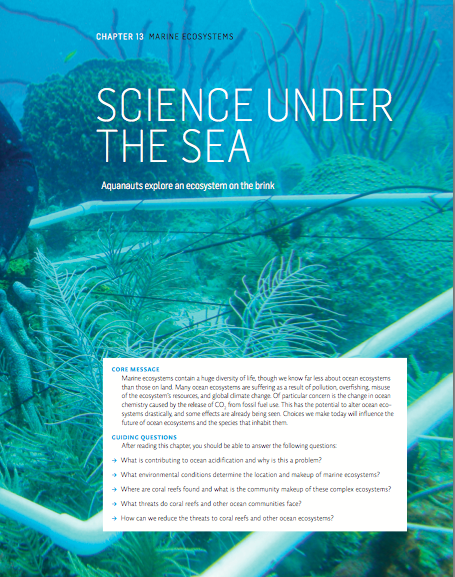 He and his six crewmates had just settled into the Aquarius Reef Base—an artificial, undersea research station located on Conch Reef, 10 miles off shore from, and 50 feet below, Key Largo, Florida. Tomorrow they would begin an 8-day stretch of underwater experiments and data collection—all aimed at understanding how the physiology of various coral reef species was changing in response to changes in ocean conditions. Slattery, a scientist at the University of Mississippi and the team’s principal investigator, was anxious to get started. Whether they knew it or not, the groupers, and all of their underwater neighbors, were being threatened by an avalanche of forces—global climate change chief among them. Around the world, temperatures were rising, glaciers melting, and the ocean’s chemistry changing in peculiar and disturbing ways. Scientists like Slattery had been on a quest to understand these changes from their land-based labs. Now Slattery wanted to dig for clues down below.